June was a busy month for the Fund with 2016 Crawford Fund Food Security Journalism Award winner, Sean Murphy and cameraman, David Martin heading off to Nepal to visit Australian-funded agriculture projects. The trip was organised by the Crawford Fund for a feature that will be appearing on ABC TV’s Landline on Sunday July 30, and is part of a larger commitment that the Fund has to highlighting the impact of agriculture projects in developing countries. For more than 25 years, the Crawford Fund has supported a range of site visits for print, TV, radio journalists and documentary makers to agriculture projects in developing countries. Now more than ever, it’s important to communicate the impact of these projects that are supported by Australia, and demonstrate their benefit to Australia. Accompanying Sean and David on the trip was storyteller, photographer and videographer, Conor Ashleigh on behalf of ACIAR, as well as Australian Project staff Dr Ian Nuberg from Adelaide University and Professor Neal Menzies from the University of Queensland. Director of Public Affairs and Communication at the Crawford Fund, Cathy Reade rounded off the group as “the arranger”. First stop for the group was to the Eastern Gangetic Plains (EGP) – one of the most densely populated, poverty stricken belts in South Asia. With deeply entrenched social structures of class and caste, and a high incidence of inequitable landlord-tenant relations, the group were there to visit two projects: a water project designed to improve dry season agriculture for marginal and tenant farmers; and, a Conservation Agriculture (CA) project to develop more intensive, sustainable and resilient farming systems into the Plains. Speaking about the first site visit exploring the Water Project, Cathy said, “The solar water pumps are prized and it’s obvious the difference the project is making, using land that is normally fallow and wasted, now growing cereals and vegetables”. The overall aim of the project is to improve the livelihoods of woman, marginal and tenant farmers through improved water use and increased dry season agricultural production. The group visited very poor, landless and untenured farmers at Saptari, accompanied by the project researchers from the International Water Management Institute (IWMI). The farmers, including many women who have formed co-ops, get together as a group, approach landlords who don’t use their land in the dry season, and rent it as a collective ensuring that they have access over the dry season while using groundwater and sharing labour and equipment. You can read more about this project by checking out the project page on ACIAR website and this factsheet. Here is a short ‘behind the scenes’ video put together by Conor of Crawford Fund journalist prize winner, Sean Murphy during his visit to Nepal. While the EGP is extremely poor, the region has the potential to become one of Asia’s great food bowls, according to the Australian Ambassador to Nepal when opening ACIAR’s work with CIMMYT and others around conservation agriculture in 2014. At the second site, where the group visited the Conservation Agriculture Project, women played an important part in the success of this project because Nepal, like many countries, is dealing with the ‘feminisation of agriculture’. “Throughout the Nepal visit, but particularly with the projects on the Terai, it was obvious that the increasing rates of male migration from poor farming households, usually to work overseas or in the cities, means that women have emerged as the key producers. Mechanisation within this project offered real assistance to the burdens they worked under,” said Cathy. The conservation agriculture project aims to develop more intensive, sustainable and resilient farming systems by incorporating Conservation Agriculture (CA) and strategic supplementary irrigation into the current farming systems. This permits more timely planting of the main cereal crops – rice, maize and wheat – increasing yield and allowing for a third crop to be sown between the main winter crop and summer rice. Meeting project staff connected with Australia through their PhD studies, Cathy said that with Australia’s farmers well aware of the benefits of CA it wasn’t surprising that Australia was exporting CA talent to places like Nepal. You can read more about the Conservation Agriculture Project on the ACIAR website. A long bumpy ride along the Sun Kosi river and up to the hills had the group amongst Australia’s longest ever aid project centered around forestry in Nepal. The ACIAR EnLiFT project follows up the earlier forest development work to improve rural livelihoods from better management and use of the forests, and added agroforestry elements. “Of course when people hear Nepal, they think of the 2015 Nepal earthquake. Ian Nuberg from Adelaide University explained to us that five out of the six sites in the project were badly affected, with one site losing 80% of houses. Devastation after the earthquake is still very evident,” said Cathy. Reflecting on the experience, Cathy said that although luck was on their side for the trip, moving around wasn’t always easy. “Our travels covered three projects in Nepal and it wasn’t easy travelling with 90kgs of equipment. But serendipity stayed with us, with the monsoon causing minimal disruption. We even had the clouds clear to show us Mount Everest which I expect will feature in the Landline story”. “But I think all involved will agree that the most memorable thing about the trip was the smiles and gratitude from the many farmers and families we met – women in co-ops welcoming us with garlands, champion farmers who opened their homes to us, farmers in markets offering us the produce from projects and the Nepalese project staff so passionate about their work”. Responsible for managing the partnerships with ACIAR and project staff in Nepal and locally here in Australia, Cathy worked closely with all stakeholders in developing the program and logistics for the group. 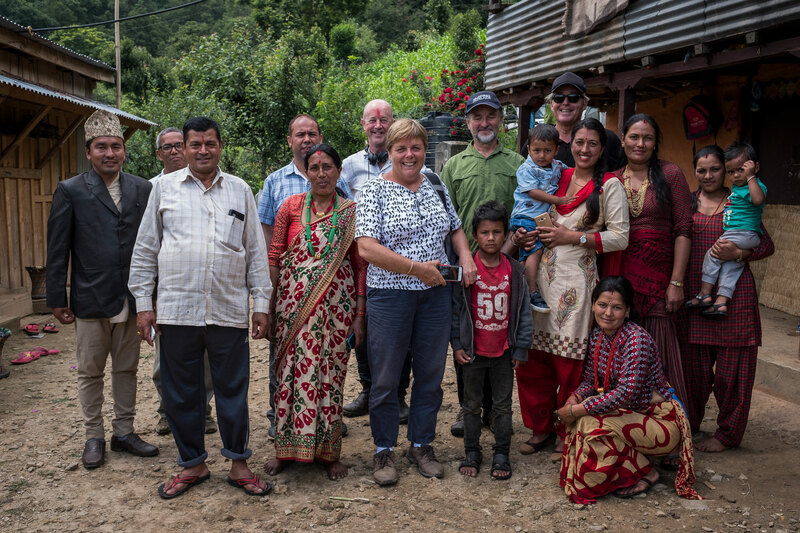 “Many thanks to ACIAR and especially the Australian and Nepalese project people who spent so much time with me before we even left to develop such an interesting schedule for Landline and the opportunity to highlight real impact,” said Cathy. “Organizing a journalist visit of this kind takes a lot of time and effort and wouldn’t be possible without many people making the necessary arrangements on the ground”. The Crawford Fund’s 2017 Food Security Journalism Award will be announced on 7 August at the Fund’s 2017 Annual Conference.